"SiteTime" opened with Scene One: Slumping October 6, 2017, followed by "Scene Two: Falling" February 2, 2018, "Scene Three: Breathing" May 11, 2018, and "Scene Four: Level Stacks" installed September 2018. Directed by Erika Senft Miller. Developed and performed in collaboration with dancers Holly Chagnon, Mireya Guerra, Sage Horsey, Mia Pinheiro, Lydia Kern, and Navah Stein. 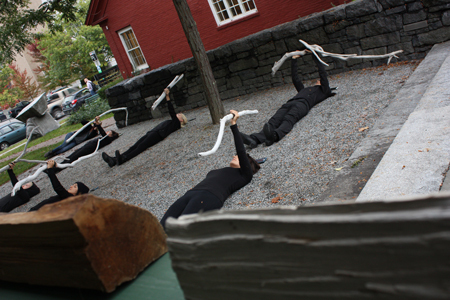 A site-specific performance presented by Erika Senft Miller and dancers. Dancers move along a projected fall line, representing the action from standing to falling to the ground. Michael Zebrowski performs a standard preparation task — planning to fell a tree using a felling ax. Documentation from Scene One is projected from the balcony onto the ground and visitor center as sound, light, and lasers support and amplify the actions in the garden. Dancers interact with bands draped over the tree branches, having gained through rehearsal a new understanding of what our body is capable of doing when we show up and work hard, beyond fear and doubts. Hopefully, the viewer is inspired to branch out and explore untapped strength and what connecting and supporting each other can be.